This is an example from one vehicle with uneven wear. This is of the left front brake pads where the inner pad is worn completely out, while the outer pad still has plenty of pad life. • Inboard to outboard brake pad wear difference of 6 mm or greater for the following driving conditions: heavy city driving, frequent elevation changes, frequent trailer towing, heavy loads. • Left to right inboard to inboard or left to right outboard to outboard brake pad wear difference of 3 mm or greater for either driving condition. This photo is from the same vehicle, but of the right front inner and outer brake pads, which both have plenty of pad material left. Inspect and measure the brake pads thickness. Determine the type of driving the owner does and compare the measurements to the information listed above (3 mm or 6 mm). The disc brake pads should only be replaced if the friction surface is worn to within 2.0 mm (0.079 in) of the mounting plates, per the Brake Pad Inspection procedure in service information. 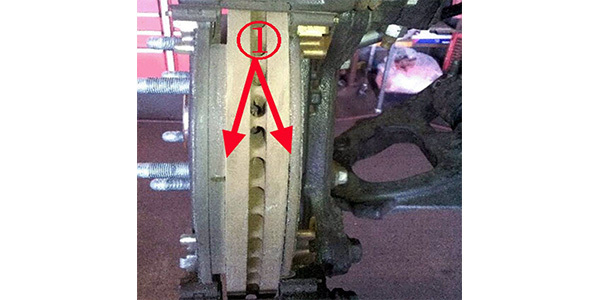 If the pads are within specification, disregard this bulletin and perform: a normal brake repair. 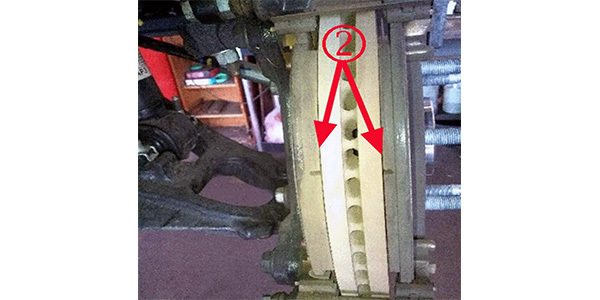 If the pads are out of specification, perform normal diagnostics to determine the cause of the concern (caliper piston binding, binding pads or guide pins in bracket, brake hose restriction, etc). 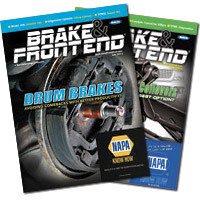 • Do not use any air tools to remove or install the brake caliper bolts. Use hand tools only. • Install an open-end wrench to hold the caliper guide pin in line with the brake caliper while removing or installing the brake caliper bolt. Do not allow the open end wrench to come in contact with the brake caliper. • When compressing the caliper pistons, use large C-clamps over the top of the caliper housing and against the back of the outboard pad. Slowly tighten the C-clamps until the pistons are pushed completely into the caliper bores. Using this method will help determine if there is anything binding. After completing normal diagnostics, if a root cause for the uneven pad wear is not found, replace the front brake pads. After repairs and pad burnishing have been completed, test drive the vehicle for 20-30 miles. The test drive needs to be performed on an open road at cruising speeds (55 mph+) where very little braking is actually performed. Immediately after returning from the test drive, lift the truck up on a hoist and spin both front wheels by hand, checking for a wheel that is hard to spin. If a wheel is hard to spin, it may be an indication of brake drag.